I've said that Knights of the Eternal Throne's story left me with a lot of thoughts that I still needed to put into written words, and I've decided that there are definitely enough of them to warrant a separate post for each chapter. I might still write a post summarising my feelings about the story as a whole afterwards; but we'll see. For now, get ready for some spoilers as I review KotET chapter one! Knights of the Eternal Throne starts in a similar way to Fallen Empire: with a new cinematic (the Betrayed one), followed my an opening crawl explaining what's currently going on. (See, Rogue One, Star Wars games have had opening crawls without being part of the main trilogy for decades! You didn't have to be shy.) A bit of a time jump between KotFE chapter 16 and this one is implied, though its exact length isn't specified and it doesn't appear to have been too long. Vaylin's just had time to establish herself as new empress and get a change of clothes. Oh, and she's decided to invade Voss, which you've come to defend. 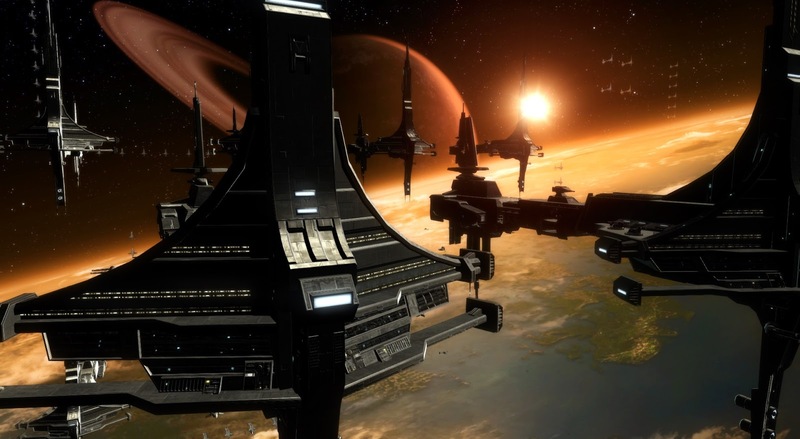 Theron is already in Voss-Ka and watching everything getting blown to bits when the Alliance joins the fight properly, with the player getting treated to some great space battle shots in the process. You land in a shuttle with a bunch of Mandalorian troops and start carving your way through the besieged city. This is somewhat reminiscent of the defense of Darth Marr's ship in KotFE chapter one, meaning you're essentially running in circles, watching things get blown up all around you, while getting directed from one objective to the next. There are a couple of neat Easter eggs here if you completed the Star Fortress story arcs, as Rokuss (Voss) will basically auto-complete a bonus mission for you and Leyta (Tatooine) will offer her sniper skills as an extra button to press during one of the early boss fights (credit to Calph for spotting that one). Eventually you rendezvous with Theron at the Tower of Prophecy, where Valkorion also reveals that he's rattling around in your head again. After defending the tower from several waves of Vaylin's troops (featuring, among other things, some of her new "Horizon Guard", which appear to have partially replaced the Knights of Zakuul as her personal elite fighters), you meet up with Sana-Rae and receive a distress call that reveals the reason Vaylin decided to attack Voss: Senya is hiding at the Shrine of Healing, trying to heal and restore Arcann. However, things are pretty dire for her with the Eternal Fleet pressing the attack. For good or for ill, you travel to the Shrine of Healing to meet with her. You need to make the final approach on the ground, and Torian provides you with a walker to get through Vaylin's ground forces in front of the shrine, which means that you get to go through an interesting vehicle section stomping skytroopers to death. On the way you run into some Voss and Gormak working together now that they have a common enemy in the Eternal Fleet. Your way appears blocked for a while, but Koth shows up with the Gravestone to give you some breathing room - yes, even if he left you before. In fact, the scene seems a little odd if you didn't fall out with him, as everyone seems kind of surprised by his appearance, even when they really shouldn't be. In the shrine, you find Senya behind a force field, which I get is a plot device to make sure that you have to talk to her first even if you want to kill her, but there's still some weird space-time stuff going on here, as regardless of what you say to her, there will suddenly be troops between you, either Mandalorians or Zakuulans... how did they get there? But never mind. 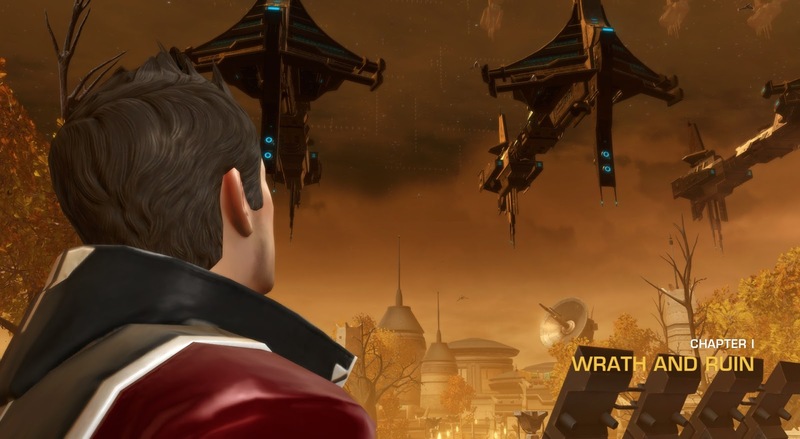 Vaylin calls in just to taunt you some more and Scorpio orders the fleet to bombard the shrine directly. Senya urges you to help her save Arcann and you get to say yes or no. If you decide to help her, you get to fight off some enemy forces for her, buying her some time to complete the Voss healing ritual for Arcann. It's still really rushed though, and she has to offer up some of her own life force to make it work, causing her to pass out afterwards. 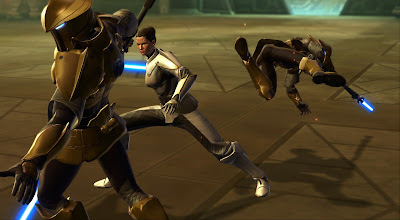 If you vow to kill her and Arcann still, some of your troops somehow get ahead of you and you eventually run in on Senya duelling Lana and get to take her down (Senya that is, not Lana). She's a pretty tough cookie even on story mode I have to say! I can't imagine that she goes down easily on veteran. When she dies, Valkorion comes out for a few last words and they share an oddly touching moment before she expires. Either way, Arcann wakes (healed, or started by the mayhem surrounding his mother's death) and makes a run for it since he's slightly delirious and confused. You arrive just in time to see him take off in a convenient shuttle, and Koth is too busy to chase him down for you. At this point Vaylin gives the ultimate kill command to the fleet (one has to wonder why she waited this long to do so), but suddenly a bunch of Imperial ships show up and join the battle. Being free-willed now, the Eternal Fleet captains are not willing to duke it out to the death and retreat, much to Vaylin's chagrin. If you killed Senya, she's also pissed that she didn't get to do so herself. Lana suggests that the Empire might have come to help. Valkorion pops up once again to make you feel insecure about your position and tell you that you must seize the Eternal Throne for yourself if you want to overcome the threat of Arcann and Vaylin. Shortly afterwards, the Imperial fleet calls - it's Empress Acina herself, proposing an alliance between the Sith Empire and your Alliance. You can express scepticism about her motives but eventually agree to a meeting on Dromund Kaas to hear her out in person. Initially, I honestly wasn't too enthralled by KotET's chapter one. Despite of jumping right into the action with some impressive battle scenes, it reminded me too much of KotFE chapter one and its very noticeable attempts to also be a tutorial for players who bought a max-level character token. The return to Voss also evoked mixed feelings in me. On the one hand, I was actually happy to go back to an existing planet and look at how things were going over there (I don't care if other people disparage it as recycling), but on the other hand it was kind of heart-breaking to see beautiful Voss-Ka laid to ruin. I always found the Voss as a species a bit annoying, but they didn't deserve that. I was kind of reminded of my first impressions of the Assault on Tython and Korriban Incursion flashpoints. Can we go back to a familiar location without it getting completely wrecked some time, please? However, the moment I got to the walker section, I realised that this was going to be a bit different. 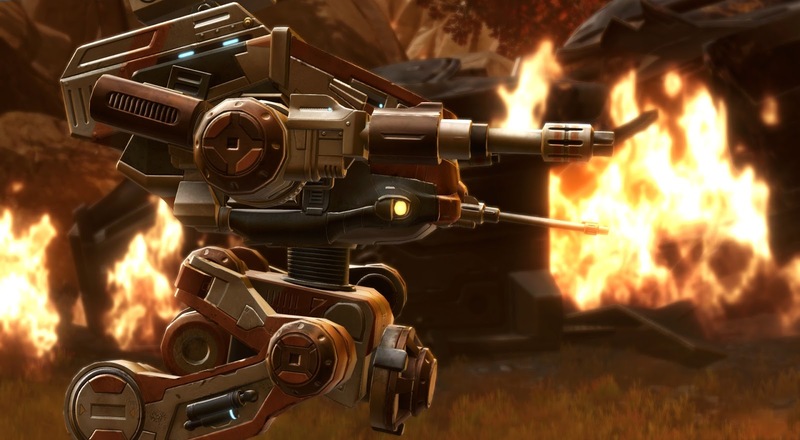 I'm neither a big fan of vehicle fights nor do I hate them, but the fact that mechanics like these haven't really been used in SWTOR prior to the HK bonus chapter made it interesting if nothing else. Even though I died a couple of times on my first attempt (despite it being story mode), I found stomping around in the walker to be decent fun. In hindsight, considering that there are more vehicle sections in KotET, the one in chapter one actually strikes me as the weakest though, due to how unintuitive it is. For example if you don't follow the winding road to the Shrine exactly, Theron won't tell you about the repair spots, so you have to figure that out for yourself; and I took a lot of damage from the "bubble troopers" until I realised that they could only be defeated by stomping on them. Seeing Voss and Gormak work together just like that actually felt a bit disappointing to me, because the Eternal Empire certainly hasn't been the first outsider to threaten them - just the most powerful I suppose. It's not that I don't want them to make peace with each other, but it just seemed to have come too easily. Of course, the last part of the chapter is where things get really interesting. KotFE received a lot of criticism for many of its choices not feeling meaningful enough, and you can tell that they tried a lot harder in KotET. There is a bit of a delay until you get to reach Senya for dramatic reasons, but if you wanted her to die, you do actually get to kill her this time. That Arcann gets away yet again is tolerable, with the hope that you will get to decide his fate this time before the story's over. And then of course we have the Empire showing up to save the day as a surprise twist - wherever will that lead? Playing the opening sequence is great fun for a Jedi Knight. Leaping into loads of enemies that melt on contact really sets the idea that this is a fast paced battle. It also sells the power fantasy of your character being an elite warrior. I even liked the fact that the initial mobs dropped no loot. No time for looting, we got hundreds more to mow down! I'm not really bothered about spoilers in the comments, but it will probably fit better as part of the discussion of later chapters (whenever I get to them). I really enjoyed this chapter as an intro to the new expansion. The mix of content, even the vehicle fight, was good. Traditionally I've not liked vehicle fights much in MMORPGs but I did rather like this one. I managed it first time but I think I had to retreat a few times to avoid dying(where larger groups were massed together), the enemy walkers seemed a bit hesitant to advance so it was easy to separate troops from their heavier armoured support. The cinematics, especially the space/fleet stuff really got me excited for what was to come!